If you operate a plumbing business, you know that scheduling can be a big headache. But now there’s a solution: use FieldSurf plumbing scheduling software, and you will immediately solve all the problems traditionally associated with scheduling and dispatching. And FieldSurf does much more than merely streamline your scheduling and dispatch functions. FieldSurf totally automates every aspect of your plumbing service business, including your accounting department and your payroll calculation, and it also keeps track of your inventory. And all of this reporting is done in real time. Let’s take a look at the various features of FieldSurf and how it is so much more than just plumbing scheduling software. Scheduling and dispatching are now a dream — thanks to FieldSurf. The entire function is automated. Your dispatcher can see at a glance which time slots are booked and which time slots are available for scheduling. With FieldSurf, there is no double-booking: the system does not allow you to schedule the same tech in two different places at the same time. Nor will it allow the dispatcher to schedule a second simultaneous booking for the same technician. Everything is done electronically: your dispatcher and your company’s management can access FieldSurf from anywhere and always know exactly how many jobs are scheduled for completion today, which jobs have been completed, and which jobs are still pending, FieldSurf also tells you when the job has been completed, and whether the customer has been billed. Going way beyond being merely a scheduling and dispatching tool, FieldSurf lets you stay on top of your personnel regarding hours worked and payroll due. Your techs use FieldSurf’s plumbing scheduling software to clock in and out at the beginning and end of each work day, and it also requires the tech to clock in when he arrives at your customer’s location and requires him to clock out when he is finished that job. This is valuable to you for more than one reason: it allows you to locate any of your techs at any time because you always know where they are. FieldSurf’s GPS “Geo-fencing” feature enables that. And it calculates the hours worked by each technician. It also deducts the cost of equipment or parts used on any job, and will then tell you not only how much payroll you owe your technician, it will also tell you how much money you make on each job. Do you know exactly how many toilets or water heaters you have in your warehouse right now? And how many of these units are sitting in your technicians’ vehicles? With FieldSurf, you always know exactly how much inventory you have on hand at any one time. You simply scan in the image of a product and its product barcode when it arrives at your warehouse; every time a technician takes an item from your warehouse and places it in his vehicle, FieldSurf will make a note of this. Then, when the technician sells that item to a customer, it is reflected on the Invoice and the Work Order, and FieldSurf automatically deducts this item from your total. With FieldSurf’s Inventory management capabilities, you always know how much product you have on hand, and you are alerted when you fall below a certain level of inventory, so you can reorder before you run out of anything. And all your Inventory reports from FieldSurf are in real time. There’s nothing like FieldSurf when it comes to keeping track of your Inventory. Another unique feature of FieldSurf is the way in which it streamlines and automates your accounting department. Remember the old days? When you wanted a report of your financials from your accounting department, you had to request that report, then you might have had to wait for days while Accounting generates that report, then you had to sit through hours of meetings while listening to these reports. Now, with FieldSurf, you or your accounting department can generate any of these financial reports instantly. No more requesting reports, no more time-consuming generation of reports, no more waiting. FieldSurf generates your financial reports in real time. There’s nothing on the market like FieldSurf. It is so much more than plumbing scheduling software. 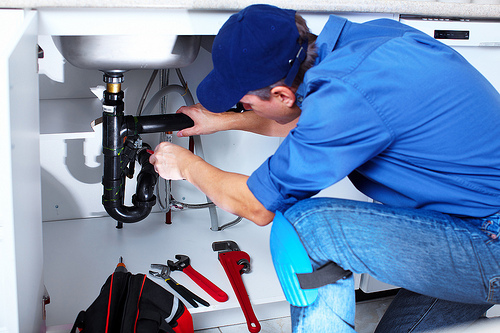 FieldSurf totally automates your entire plumbing service business like no other system. FieldSurf is easy to learn and easy to use. There is nothing to download — FieldSurf is 100% Internet accessible. You can access FieldSurf from any desktop computer, any tablet computer, and any smartphone. It’s easy to use — you can be up and running with FieldSurf the day you register. And if you’ve been using Quickbooks to do your accounting, you will be thrilled to know that FieldSurf integrates seamlessly with Quickbooks: simply import your Quickbooks data into FieldSurf and you are up and running on day one. Your staff will love FieldSurf. Your dispatchers and schedulers will love our plumbing scheduling software because it makes their jobs easier and reduces the possibility of mistakes such as double-booking or sending the technician to the wrong address. Your Inventory personnel will love FieldSurf because they can always tell you exactly how much Inventory you have on hand at any one time, and when to reorder. And your Accounting department will love FieldSurf because it allows instant generation of financial reports — so you always know exactly what’s going on in your plumbing service business at all times. You owe it to yourself to give FieldSurf a try and see how it can bring your business into the 21st century. If you haven’t been using a field service management system before, you need to look at FieldSurf and how it can automate your business and make your life so much easier. And if you are already using another field service management system, you owe it to yourself to take a look at all the fantastic features and capabilities of FieldSurf that no other field service management programs have. FieldSurf will change your life. Get FieldSurf and get into the 21st century. You’ll be so glad you did.